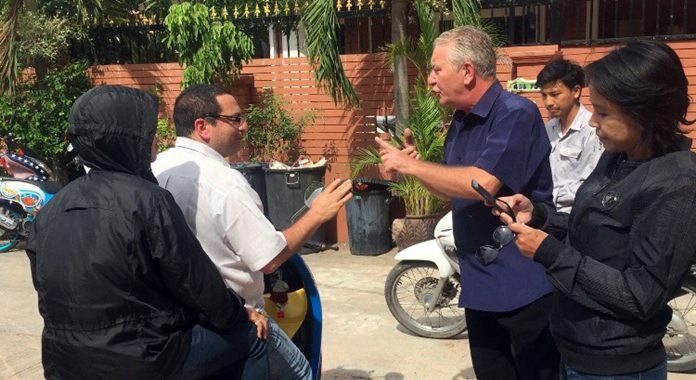 Executives representing the Arcadia Beach Resort condominium project arrived via motorbikes, but abruptly canceled a meeting with neighboring homeowners after the press showed up. Executives representing the Arcadia Beach Resort condominium project abruptly canceled a meeting with neighboring homeowners after the press showed up to report on their conflict over condo-construction debris falling on their homes. Three unidentified people, including a foreign man, refused to speak to homeowners at the Grand Tanyawat Home 2 development Aug. 2 after seeing reporters outside the damaged house where the meeting was supposed to take place. The foreigner also tried to stop photographers from taking pictures. Arcadia Beach Resort is a condominium project developed by Heights Holdings on Soi Mu Ban Chomthian Niwet. The condominium is comprised of four buildings, each eight stories tall with 1,118 units. However, residents in Grand Tanyawat went to the media last month after repeated complaints about damage caused by negligent construction went unresolved. Norwegian Bjorn Ingolf Soreng complained earlier that pile-driving for the four towers has caused large cracks in walls. He added that contractors sent over some workers who replaced tiles and patched cracks, but did not address the core problem. Waree Suayusai, another homeowner, said damage has gone on for two years, with objects falling on their homes and noise keeping them awake. With the meeting canceled, homeowners said they now plan to sue Heights Holdings with the help of the Scandinavians Helping Center.